To my surprise, the decision-making did not stop there. Because I had asked Rex for the one set of Christmas stamps, he asked me to narrow down my choice even further. 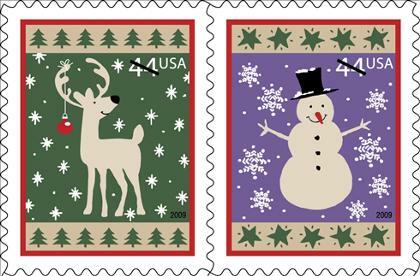 He held up two types of stamps: one had a picture of Mary and Baby Jesus, while the other had various non-sectarian Christmas symbols like snowflakes, Frosty, and Santa. As he held these two up for my perusal, he asked me "religious or irreligious?" I began to process the word “irreligious”, which I had never heard before. But as a long line was forming behind me, I quickly told Rex I'd like the "religious" ones. 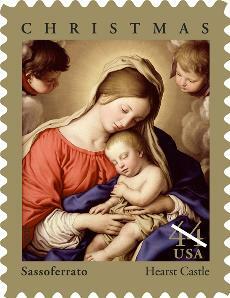 It turns out the image contained on these stamps is by a 17th-century Italian painter named Sassoferrato. It’s a nice picture. Still, the fact that I had to choose between two alternatives, and do it twice, is very telling. The Postal Service, in an effort to not offend anyone, has recognized the dichotomies that exist, and has chosen to offer something for everyone. The second choice I had to make—between Mary holding the Christ child and the snowman—makes it clear: in 21st-Century America, there are two Christmases to choose from. The two Christmases are separate and distinct. For the sake of discussion, let's call them Christmas #1 and Christmas #2. Christmas #1 is the so-called religious way to celebrate the holiday. It emphasizes the entrance of Jesus into a sinful world. It's certainly an event worth rejoicing over, as He came to rescue mankind, who had sinned and become separated from a holy God. A Savior was necessary, and His birth is what is celebrated. Christmas #2 invokes sentiment, nostalgia, and feel-good moments. It urges Americans of all faiths to enjoy family and friends, to shop for loved ones, to give to charities, to eat, to party, to take some time off of work. It’s about chestnuts roasting on an open fire, and silver bells. It results in timeless stories and movies like Clement Moore's "A Visit From St Nicholas", and Chevy Chase's "Christmas Vacation". Each of the two Christmases manifests itself in parallel ways. The perennial TV event for Christmas #1 is “A Charlie Brown Christmas”, with Linus’ stirring recital of the 2nd chapter of Luke. Christmas #2 is about Will Ferrell’s "Elf", or, for older viewers, "A Miracle on 34th Street." Christmas #2 has songs like "Silver Bells", "Winter Wonderland", and "I Saw Mommy Kissing Santa Claus". Christmas #1 gives us "O Holy Night", "Silent Night", and that "In Exelsis Deo" song. Both Christmases are prone to nostalgia. Those who prefer Christmas #1 get the warm fuzzies when they think about baby Jesus, the manger, and the Wise Men. Mention Christmas to #2 folks and they smile as they remember Ralphie and the quest to acquire that BB Gun. Of course, this dichotomy needn’t exist. It doesn’t need to be an either/or thing. But each of the two Christmases has adherents, a small minority of which are very vocal, a bit snobbish, and suspicious of the motives of the other Christmas. Some of those in the Christmas #1 camp are offended that the clerk at Target says “Happy Holidays”. It is seen as not just an affront, but part of a greater conspiracy to rid America of its Christian roots. A few who hold this view see a hidden agenda in every component of Christmas #2. They can’t just sit back and enjoy “Elf.” While wearing their "reason for the season" t-shirts, they complain that characters in that film are willing go all out to say they believe in Santa, but will not be so bold in saying they believe in God. They shake their head when they see Hanukkah or Kwanzaa greeting cards at Wal-Mart. The Christmas #2 folks have some conspiracy theorists, as well, and a few of them arrive at conclusions just as irrational as their counterparts. They protest the inclusion of nativity scenes on public property. They insist that songs like "Silent Night" have no business being in the school program. It’s a "Naughty vs. Nice" list of which retailers won’t let their ads contain the word “Christmas”, the implication being that real Christians should spend their money elsewhere. Lost on the compilers of such lists is the fact that the stores in the "good" list have their ads full of Santa, elves, etc. There's not a baby Savior to be seen anywhere. Ah, the irony. Christmas #2 people can be just as silly. Some retailers, thinking they are walking on PC eggshells, have renamed Christmas trees to “holiday trees”, a ludicrous over-reaction. Has anyone ever walked out of a store and refused to do business with them because they still call it a “Christmas” tree? I doubt it. Renaming a very traditional item to appease non-existent protesters qualifies as going overboard. To be fair, most people, while preferring one Christmas or another, are reasonable. They realize that the two Christmases need not divide us as bitterly as the divisions like that between Republicans and Democrats, dog and cat lovers, the Ginger/Mary Ann debate, or the one where the sparks really fly: PC vs. Mac. This is the state of Christmas in 2018. It's very different from 40 years ago as I was growing up. What does the future hold? What will Christmas in America look like 30 years from now? Will the two Christmases grow further apart, creating a huge chasm? Will the two Christmases converge? One thing’s for sure: if we ever get to the point where we stop allowing ourselves to be divided over Christmas, we will find something else. We always do.